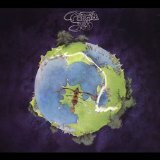 Yes released their fourth album, Fragile on January 4, 1972, a scant six months after Rick Wakeman left The Strawbs and joined Yes, bringing synthesizers and another strong classical music background to a band on verge of breakthrough. While contractual issues precluded any official credit for his keyboard and co-writing work on the album, Wakeman’s presence solidified the band, their sound and their place in rock history. Fragile quickly rose to #4 on the Billboard 200 chart and pushed the band to the forefront of the burgeoning prog-rock movement. The success of the album was driven by the surprise hit single “Roundabout,” a shortened version of the 8-plus minute romp on the album. The cut-down single became a cross-over AM and heavy FM hit, an extremely unusual achievement (not to mention prog-rock on AM!) that lifted an otherwise excellent prog-rock album to unheard of heights and began a nearly 40 year reign for Yes as the quintessential and longest-running prog-rock show on Earth. Surprisingly, Fragile is not on Rolling Stone magazine’s Top 500 Greatest albums of all time. I think it should be, and in the first 100 at that. However, it is available as a CD on Amazon (click here for my Yes album list) and download tracks on iTunes (click here to access my Yes playlist).